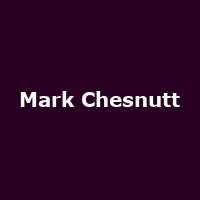 Mark Chesnutt is an American country music singer and guitarist from Texas. He began recording in the late '80s, scoring a number of hit songs on tBillboard Hot Country Songs chart between 1990 and 2002, including a number of number 1s. His 1998 cover of Aerosmith's "I Don't Want to Miss a Thing" crossed-over to the Hot 100 charts. Mark released his debut album, "Doing My Country Thing" in 1988, followed by: "Too Cold at Home" (1990), "Longnecks & Short Stories" (1992), "Almost Goodbye" (1993), "What a Way to Live" (1994), "Wings" (1995), "Thank God for Believers" (1997), "I Don't Want to Miss a Thing" (1999), "Lost in the Feeling" (2000), "Mark Chesnutt" (2002), "Savin' the Honky Tonk" (2004), "Heard It in a Love Song" (2006), "Rollin' with the Flow" (2008), "Outlaw" (2010) and 2016's: "Tradition Lives".